When tasked with asking any artist to share their insights with the world for my first CG Channel feature, a shortlist immediately popped into my head. Top of that list was Simon Kopp. His design work is stunning, his use of colour is bold – and man, does he make his images look epic. 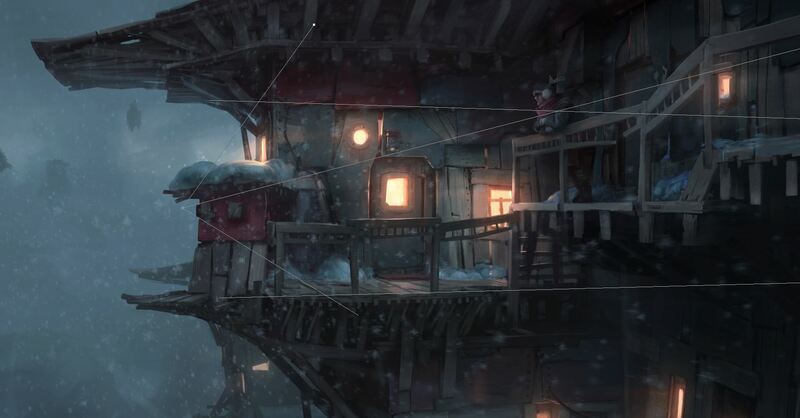 A recent graduate, Simon caught the attention of gamers everywhere through his involvement on Moon Studios’ cult platform adventure Ori and the Blind Forest, on which he was a freelance concept artist and illustrator. Destructoid awarded the game 9.5 out of 10, praising the detailed, evocative visuals as being similar to recent Rayman titles, but “easily surpass[ing] them in quality”. 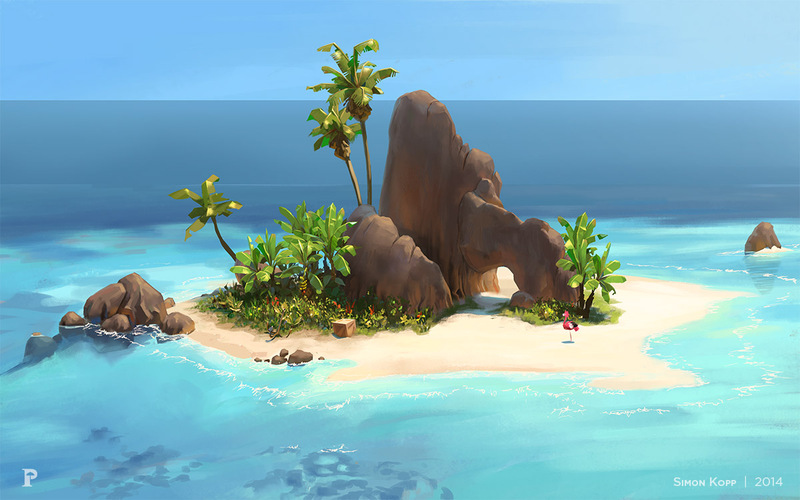 As well as Ori, Simon has been involved with ongoing game development project Airborn – Piño’s Journey and contributed to games art book Substrata. So how did he get where he is today? SK: I’ve always drawn, but I think I started painting when I was 14 years old. I also made mods for Warcraft 3 and Unreal Tournament. They were really nothing but play, but they got me interested in game development. Back then I switched beween 2D and 3D quite often, because I didn’t know what I really wanted to do. There were times when I was certain I’d be a 3D modeller and times when I thought 100% that I’d be a concept artist. Turns out I’m a concept artist. 3D is way too much button-pressing for me. At some point in 2009 or 2010, I joined the Airborn team around Steffen Unger. I asked him a lot of questions about 3ds Max. He was very patient, and to date everything I know about the software goes back to him. Airborn and the people working on it taught me a lot – and they became good friends of mine. Two of them were working on Ori and the Blind Forest, which I joined last May after finishing my studies in February 2014. Ori was my first grand project in the industry, and I’m now freelancing. CGC: Ori caught the eyes of fans around the world. How did the look of the game evolve? SK: I wasn’t actually part of the look dev. The bulk of the development was done by Maximilian Degen in the first two years of the project. After two years, Johannes Figlhuber joined in and helped finish the basic look. I joined ten months before release. I had been hired to do mainly polishing tasks and dress whatever hasn’t been set-dressed to that point. My job was basically making everything a tad more detailed and beautiful. I worked with the tech team as they developed new frameworks so I could animate the flowers and later make them react to the player. Two colleagues and I also went over every scene in the game and added lots of little stories to the world. Perhaps ‘stories’ is too big a word: they’re more like nice little touches – a nest here, a wooden structure there – that make you think about what has happened when you stop to look at the scenery. 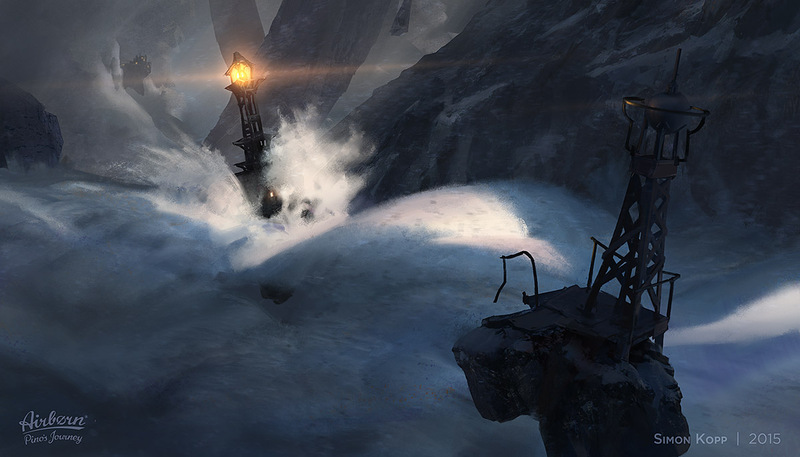 The team consisted of around 15 people at release – the art team was about six. I learned a lot about coping with other people during stressful times, and I had two other people to co-ordinate myself. That was also something I’d never done before, but it seemed to work fine. 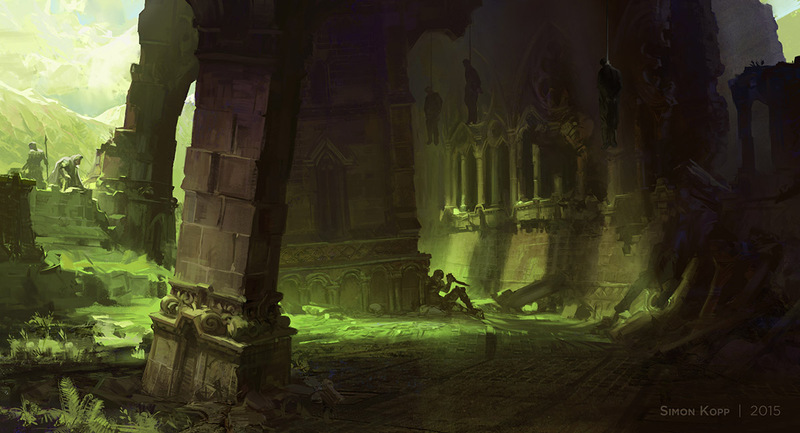 Concept art for Airborn – Piño’s Journey, an ongoing project that began as an attempt to create a Zelda-like minigame and has since become a sandbox for environment design. “It’s really just having fun,” says Simon. CGC: You’re now working on Airborn. What should people know about the project? SK: Airborn is a very long-term project. It started as a Zelda-like minigame: it’s a shattered world with countless floating islands. There’s a lot of exploration, cool abilities and a lot of character. Pino grew up with his grandparents on a rather idyllic island somewhere in the outer regions of this world. It has a nice warm Mediterranean feel, and a village not far from his home. He really wants to be a postman in order to be able to fly the little plane he built himself, but he hasn’t got his license yet. To do that, he has to overcome some challenges. His goal is not only to deliver post but to find his parents, who must be out there somewhere. Today, Airborn is more of a portfolio project. It didn’t start out as one, but it has become impossible for some key people to work on it, so now it’s really just some of us working on the world and having fun with it. It’s kind of our little baby that will most likely never grow up. Simon describes his art style as having been influenced from artists ranging from John Singer Sargent to Hayao Miyazaki, but stresses that finding a style is more a matter of constantly producing work than a conscious quest. CGC: How did you came to discover your own personal artistic style? SK: I think finding a style is just a matter of working and not caring about style. My own ‘style’ is just a mix of whatever I liked from other artists. I tried to my paintings look like theirs, so I emulated some of their techniques. I learned a lot from Thomas Scholes, Craig Mullins, John Singer Sargent, Paul Richards and Miyazaki/Studio Ghibli. There are also influences from friends like Johannes Figlhuber or Jana Schirmer in my work. CGC: What games have caught your attention visually? SK: I tend to play games nowadays mainly to see the worlds and analyse the art direction. I started Diablo 3 again a few weeks back for a job and am kinda hung up on it, but that doesn’t happen often. I liked the visuals of Witcher 3, although my PC is too weak to run it, and I still like the look of Killzone 4. It really stuck with me. Life isn’t (always) a beach. 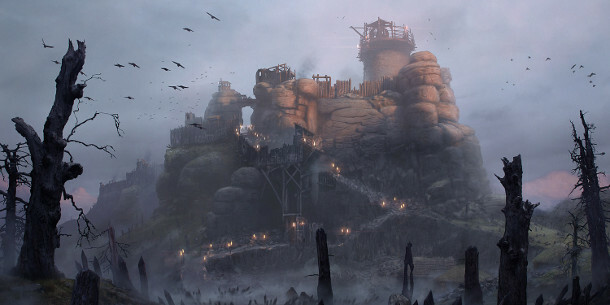 The secret of designing believable worlds for games and other CG projects is to include some of the grit and diversity of the real world, advises Simon. Contrast keeps things interesting. CGC: What’s the secret of designing a believable world? SK: I think it’s really important to look at our world and how it’s built before you create your own. If you want to make your own game world believable, you should not create a utopia. Our own world draws life from diversity. There are punks and hipsters; there are socialists and nationalists. There is contrast in every society. There can be dominating factors, but the small contrasts make it interesting. CGC: What do you take from the real world when creating new concepts? SK: Everything, kind of. I can only envision what I know, so it all goes back to the real world in the end. I tend to get inspiration from other artists too, but that also goes back to their own experiences in the real world. I think it’s all about creating a huge visual library and trying to see as many things as possible. References play a major role in my work and I use them to search for shapes and [visual] languages in most things. While painting in Photoshop, paths provide unobtrusive perspective guides if you don’t like to overlay grids on your work. 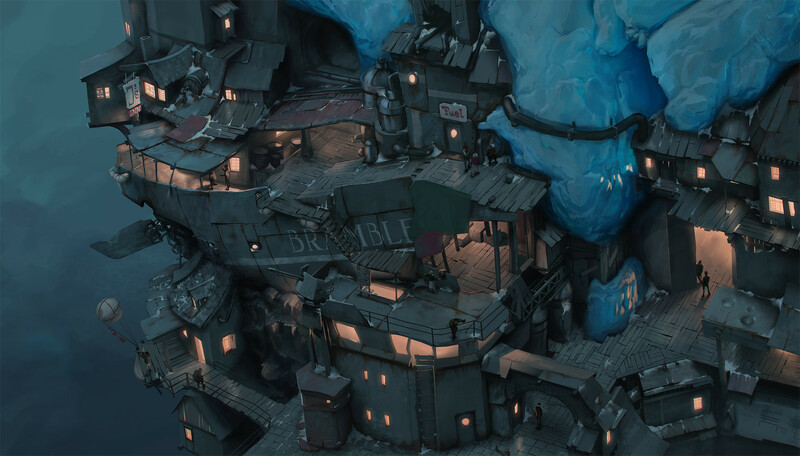 Click the thumbnail above to see Simon’s own paths for this concept image from Airborn. CGC: Tell us one neat technical tip that you’ve never seen written down anywhere. SK: You can use a simple path as a helper for perspective if you don’t like having grids overlaying everything. Just create a new Shape layer and use the Pen tool to add a path with one end on the vanishing point and the other wherever you need it. Holding [Ctrl] while having the Brush tool open will let you move the end points of the path wherever you need them. I use this technique every time I paint something big and I find it very handy. Surviving as a freelancer can be a challenge. Talk to artists working in production before you graduate, advises Simon: you can’t always rely on your school to prepare you for life in the real world. CGC: Is there anything you wish you’d been told before you got into the industry? SK: I wish my university had given me a bit more advice on the business side of art, and freelancing in particular. I hear this complaint a lot, and it always seems to have been this way. I can’t understand that. I realise that not everyone wants to be a freelancer after school, but at least having it as a choice would be a start. School was supposed to prepare me for my later life, but I had to learn everything from friends and colleagues. CGC: What are you passionate about outside of art? SK: Bike trials! It’s a very niche bicycle sport. It’s very hard to learn and incredibly hard to master – it’s one of the most technical bike sports there is. I try to go out and ride as often as I can, because it’s the perfect counterbalance to art. Art is all about the head: nothing comes from your body – only my right arm is trained to behave like my brain wants it to. Bike trials is exactly the opposite. It’s about relying on reflexes and learning to control your body perfectly. If you try to think when you’re balanced on a three-metre rock, you will most likely fall. Bike trials is perfect for clearing your head: it’s only your body, the bicycle and the obstacle. Liz Cooper is an indie game producer and associate director of placement and alumni relations at Gnomon School of Visual Effects. She also founded non-profit organisation Gamers for Good.